The Sewing Lessons availability at Stacey Sansom Designs is always changing as new students come in and more experienced students go out. I welcome each and every one of these changes. Many people are saddened by changes when it comes to their businesses, but I welcome them because that means that I am doing my job correctly. When a student leaves with even one more skill than they had before they came to me, I feel like I have accomplished something. Not every student will leave with every skill I have and I am okay with that because I have spent over 30 years building on my basic skillset, I cannot expect anything less from the students that come to me. Learning to sew and building on those skills is a marathon exercise. Much like playing a musical instrument, it requires training and practice. I never make claims that you will be leaving my studio with the ability to make your teenage daughter’s prom dress. You may not be able to do that for many years. I do, however, promise that anyone that comes consistently to class and practices at home can learn to sew or re-learn to sew with confidence. Due to demand, I have opened up additional class spots in my schedule. Unfortunately, most of these classes are early morning spots. Perfect for the parent that has dropped their kids off at school and wants to focus on themselves. Please note that I reserve these class times are subject to change at any time. I will work to accommodate your schedule as best as I can, but sometimes it becomes not feasible to continue or change a time to fit your needs. What do the lesson levels mean? I have lesson levels so that I know what we will work on each week. There are different worksheets that we do during the first lesson regardless of your skill level. These help me gauge where you are at and potentially how rapidly you will progress. An absolute beginner/newbie level student is one that has never touched a sewing machine before or has never sewn before–ever. 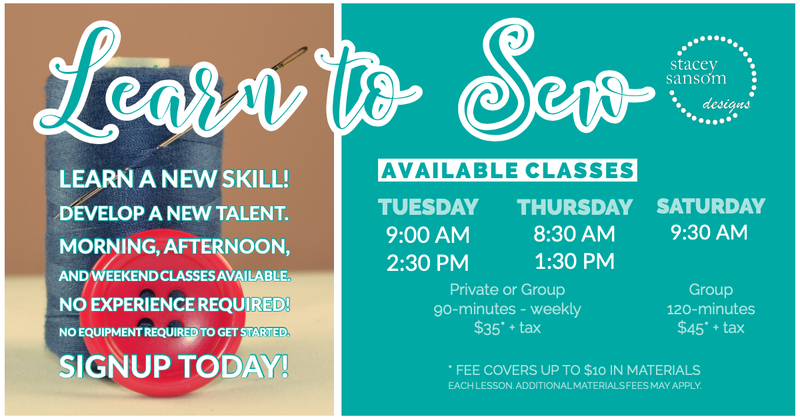 A beginner level student is someone that has done some sewing before, but has never used their current machine or only has basic skills like hand sewing or sewing on a button and wants to learn more. An intermediate student is one that has some sewing skills and/or has used their machine before but are looking to increase or improve their skills. An advanced intermediate/skilled student is one with foundational sewing skills but is looking to improve on certain skills. They know what they want to work on and what they want to learn next. Stacey Sansom Designs will teach students as young as 8-years old and up. I do not discriminate based on age or gender, but I do not teach students under 8-years of age. All students between ages 8-11 years of age MUST be accompanied by an adult if they are in a group lesson. Accidents can and do happen and your supervision is required to prevent injury to your child. Sewing lessons are great things to take with your child. Injury prevention aside, having a parent with basic fundamental knowledge of what we are doing in class is helpful for these younger students to progress as they are able to practice at home. Students age 12+ are welcome to attend without an adult, but must sign a liability waiver in case of injury. Each class fee covers up to $10.00 in materials or supplies for the lesson. Additional materials fees may apply. You will have the option to purchase a kit for each lesson or bring your own supplies. Payment is due before class begins. If you are paying via cash on location, payment is due before class begins. Please bring exact change. Change is not kept in the studio. Any overage will be applied to your next lesson. Saturday classes will only be held IF TWO OR MORE STUDENTS register for classes. You will be notified when class will begin based on when the appropriate number of students have registered. If you sign-up for a group lesson (Monday-Friday) and there are no additional students, you will start as a private lesson at no additional cost. You do not have to wait for the entire group to sign up. Please note that I reserve the right to group you with other students after the first 3-4 lessons that are at your sewing level in the future. You are not required to have your own equipment when you begin lessons. I have machines in-studio that may be used as necessary. Purchasing equipment is encouraged quickly after classes begin. Practice at home speeds up the learning process. Equipment is required for practice. Projects are sent home for completion once you are confident to finish on your own. Please note that I set aside time for each lesson and focus on your lesson. I do expect cancelations from time to time, however, please let me know ahead of time if you have reason to be late or not attend. We can reschedule later in the week if spots or available or the following week. I will here and ready for class. Do not make me wait if you are not able to attend. PLEASE DO NOT COME SICK or if you have a sick child or significant other in your life. I tend to catch all the bugs, please do not bring them to my studio. If you show up sick, you will be sent home and your lesson will be rescheduled.